You can have the perfect morning every morning when you wake up to your automated home. Just think, one touch of a button by your bed and the lights gently rise all the while not disturbing your family member still sleeping. 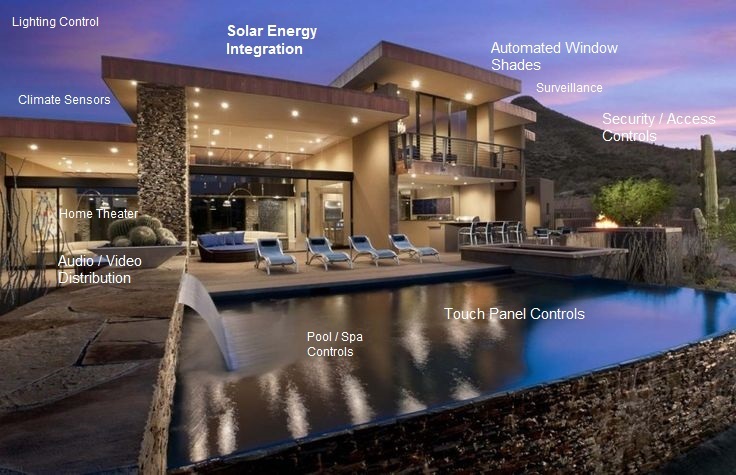 Walk into your bathroom that is already at your preferred temperature; have the TV turn on to your favorite channel without any need to find switches or remotes; this is just the beginning with a home built to utilize technologies readily available and integrated by professionals with years of experience. Just think of the possibilities, have the peace of mind knowing that whether you’re at home, down the street or on the other side of the world, your Smart Home System is always working and most definitely always in reach. Receive alerts, email notifications, pop-ups on your tablet, PC, or Smartphone. Need a little more comfort, you can even view your cameras, arm/disarm security systems, make sure lights are turned off and more from anywhere! When you’re finally at home with the family, set the mood in your living room in an instant with the push of a button. Easily control multiple audio and video sources with a handheld remote, tablet or smartphone; the same remote can lower your shades, dim the lights, and lower the projector screen for an immersive movie-watching environment. No need to worry about replacing your prized stereo or HD television. Our Smart Home Technology can integrates with your favorite brands flawlessly. At the end of a long busy day, wind down with some relaxing music throughout the house. As you prepare for bed, Your Smart Home System takes care of the rest with customizable nighttime presets, ensuring your shades are lowered, lights throughout the home are turned off, and every lock is secured. Schedule the process to happen every night at the same time, or do it all at the touch of a button; it’s up to you. From simple to complex, CRC can exceed your expectations by providing the design, installation and support required to make your home the “smartest” on the block!